← How Did Scaramanga Escape from James Bond? I was excited to see Incredibles 2. It got rave reviews and audiences seemed to like it, so I definitely wanted to give it a shot. And it turned out to be pretty awful. Granted, I’ve only seen it once. But it only took me one viewing to know I loved The Incredibles. When the end credits rolled on that film, I just sat smiling and wanting more. When the end credits rolled on Incredibles 2, I was left perplexed and with a heavy feeling of disappointment. 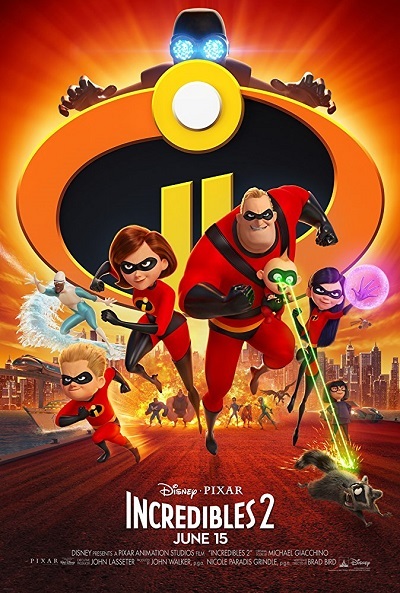 Incredibles 2 just feels like a series of disconnected events that are kind of fun at times, but they fail to add up to anything or offer anything new. The first film is one of my favorites, so I don’t take any pleasure in pointing out the flaws in its sequel. Maybe my mind will change in the future, but for now I offer my undigested thoughts on Incredibles 2. There’s a real sense of misdirection in this film. Not the kind that leaves me guessing about what’s behind the mystery, but the kind that makes me feel like the film doesn’t know what it’s doing. The first half of the film is spent making superheroes deeply unpopular again and then having them clean up their image in the public eye. But it does it in such an awkward way. Seeing Elastigirl sitting around on a motorcycle waiting for a crime to solve reminded me of when Mr. Incredible and Frozone did that in the first film. Elastigirl even comments on that connection. But in their case, they were trying to relive the glory days while in her case, she just looks out of place and like she’s uncomfortable with the whole charade. It doesn’t even lead to a memorable action sequence, but I’ll get to that later. Something just feels very off about the first half of the film, and I can’t quite put my finger on it. I just don’t enjoy it. The first half of The Incredibles is also rather drab and sad, but that’s to highlight the fact that Bob is so frustrated with his life, and he yearns to use his powers for good again. That makes his eventual heroics that much more satisfying. In the sequel, the frustration is still there, but it’s unclear what the end game is. It turns out that the end is really easy to see coming, and it’s not impressive or satisfying at all. It’s just a “villain of the week” kind of thing where you can tell who the villain is going to be right from their introduction. I’m normally surprised by films throwing twists and curveballs I never saw coming, but even I spotted this twist with ease. There’s no surprise or mystery here. It’s all just straightforward and run of the mill. I’ve seen this kind of film many times before. There’s nothing new or interesting. The thing the first film had that the sequel lacks is any kind of self-awareness. In the first film, characters comment on the folly of having capes and monologuing, both of which the villain winds up using to his detriment. Those are common superhero tropes, and it’s funny to hear them commented on. 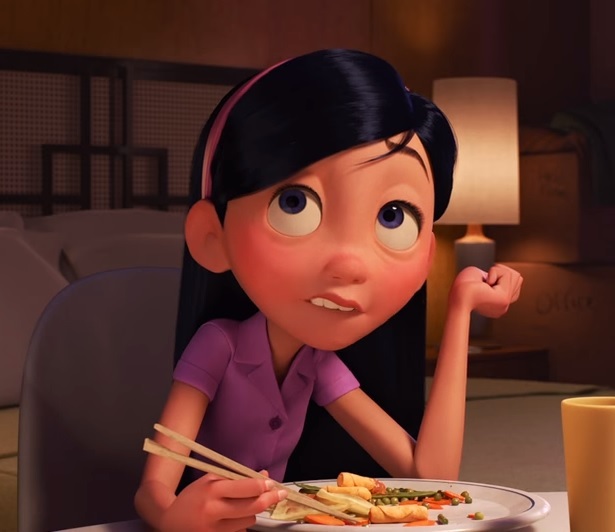 There is none of that in Incredibles 2. There’s no ironic end for the villain or subtle commentary on the superhero genre. It’s just played straight and boring. Plus, there’s a moment where the villain monologues to Elastigirl for no reason. They don’t have a particularly close relationship or anything like that. The villain just gloats over her for no reason in order to explain the big, evil plan to the audience. Yawn. Seen it all before. Quit monologuing! There are a lot of side stories that fail to connect to the main story in any meaningful way. Nowhere is this more evident than in the subplot involving Violet and Tony. The first thing we see is Tony getting interrogated just like the babysitter in the short film Jack Jack Attack. This makes it seem like Tony is going to be an important character and maybe his relationship with Violet is going to be tested and morph over the course of the film. But no. Violet gets upset because Tony has his memory wiped, and he completely forgets about her as a result. She spends the rest of the film mopey or angry at her dad because of that. Bob tries to make it up to her, and this leads to one of my favorite scenes in the film where he takes his family out to eat at a restaurant where Tony works. It’s just so awkward in a good way. But none of that really matters. Tony never becomes an important character, and it doesn’t lead to anything substantial. It’s just filler. Violet and Tony are just scratching the surface of this film’s pointless setups. That’s sadly the case with Bob’s parenting adventures. If a film is going to split up its characters, it should have them learn something about themselves that they couldn’t have learned in each other’s presence or bring a new skill to bear when they come back together at the climax. You might say that they do that with Jack Jack, but that’s nothing new. The audience already knew Jack Jack had powers at the end of the first film. Every character, one by one, has to figure out what we already knew. It’s tedious, and it makes them seem a little slow when we’re so far ahead of them. Like I said, there is no integration of parenting skills or even math skills in the main story or the final conflict. Violet learns that it’s okay for her to hang back and take care of the baby. I didn’t even realize that was supposed to be an important plot detail or something her character was struggling with throughout the story. They spent so much time on Bob struggling to learn a new way of doing math. Wouldn’t it have been nice if that actually paid off in some way? Maybe the villain’s plan relies on a certain algorithm that can’t be solved with the old way of doing math that Bob was familiar with, but it can be solved the new way he learned. That would give Dash something to do. He doesn’t have anything to do or learn in this film. Except that it’s fun to tell the Incredimobile what to do. I like Bob’s restraint when he sees his old Incredimobile displayed on TV. He doesn’t just immediately call for it like a child would. He chooses to be the bigger man and set a good example for his children… which gets disregarded later when the kids just steal the car anyway. It does lead to a wonderful action sequence as the kids discover all of the cool things the car can do, but it sadly (and ironically) doesn’t go anywhere or lead to anything more significant than just a series of gags. The house that Bob and the kids stay in has these cool floors in the living room that open up to reveal little pools. But they don’t have much of a payoff. Maybe Frozone uses them in one scene, but if he did it didn’t leave an impression on me. I love a scene where Jack Jack fights a raccoon in the backyard. But this, again, has no payoff. Later, there’s a home invasion by super-villains, and the kids have to defend themselves as best they can. It would have been a perfect moment for the raccoon to reappear and fight alongside the baby this time. Like he would be saying, “Don’t mess with this kid. Only I get to do that!” There are just so many things the film could have done with all of its fun setups. Maybe Bob would learn that he’s acting like a petulant child after being around his kids for such a long time, and then he would use that knowledge in his crimefighting techniques to avoid causing so much collateral damage. A big theme of the movie is superheroes causing more damage than they prevent. I wish they would have driven that point home by forcing the most reckless and destructive superhero to learn to be lighter on his feet and use his mind instead of just his muscles. There are four main action set pieces, and each one is about trying to stop fast-moving vehicles. It gets repetitive after a while. The first one is the Underminer’s drilling vehicle that Bob tries and fails to stop until it demolishes part of City Hall. Next is a train that goes the wrong way, and Elastigirl manages to stop it as the first part of the train falls mostly off the edge of the tracks in a callback to Mr. Incredible at the start of the first film. Elastigirl also saves a diplomat from an out-of-control helicopter. And, finally, the whole gang has to stop a luxury cruise liner from crashing into the city by trying to turn it. Sure, there’s an exciting foot chase sequence between Elastigirl and the Screenslaver sprinkled in there, but for the most part, the film is just one out-of-control vehicle after another. Not much variety. Of course, I admit the first one did the same thing. Mr. Incredible fights a giant robot and defeats it the first time and then gets utterly decimated by it the second time. The third time, he’s joined by his whole family and Frozone. It’s different enough each time that I barely even notice that it’s familiar territory the two other times after the initial encounter. It’s fun to see the same machine get upgraded each time to learn from its past mistakes and constantly provide new challenges to Mr. Incredible. There’s no such evolution or progressively difficult challenges in the sequel. It feels like we end where we started with the heroes trying desperately to stop a giant vehicle from crashing into something. Seen it all before. Early in the film, Elastigirl gets a new motorcycle to help her in her crimefighting. She thinks it’s really cool and she spends a little while admiring its design and getting used to its power. In her first solo action sequence, she uses the bike to great effect to propel herself toward a speeding train. However, once she’s riding on the train itself, she comes to a tunnel and she has to think quick to avoid getting crushed. She ditches the bike and it crashes in a fireball that apparently leaves no damage on the train. That destruction is never commented on, even though the whole point of her acting on her own is to show that superheroes can save the day without causing harm. She just goes through the rest of the film as though the bike had never existed. It’s never even mentioned again. That sums up Incredibles 2 to me. It’s a fun ride at times, but in the end it’s just a disposable piece of action fluff that means nothing and isn’t even worth giving a second thought to. That’s incredibly disappointing. This entry was posted in Random Stuff and tagged action movies, animated films, comic books, films, incredibles, movie review, movies, pixar, science fiction, sequels. Bookmark the permalink.